If it were not for the similarities between baking and chemistry – along with a deep passion for mathematics – Jennifer Urban might be making a name for herself as a pastry chef instead of one of the top science students at The College of New Jersey. A senior Chemistry and Math double major, Urban says she flirted with the idea of attending culinary school until she fell in love with mathematics and chemistry her junior year of high school. After completing a rigorous first-year courseload, Urban jumped right into research by participating in TCNJ’s Mentored Undergraduate Summer Experience (MUSE). 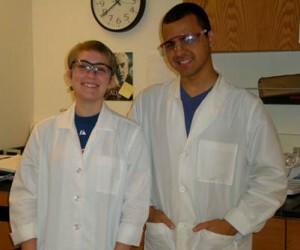 An eight-week, full-immersion research program at the College, MUSE enables students to work full-time on research questions while participating in a variety of scholarly and community-building activities. Indeed, the summer experience certainly whet Urban’s appetite for research, as she has continued the project ever since summer of 2009. Working under the guidance of chemistry professor Dr. Heba Abourahma, she investigates the solid-state stability of cocrystals. In short, cocrystallization can be used to alter the physical properties of its components, for instance stability or melting point, and is thus of great interest to the pharmaceutical industry. 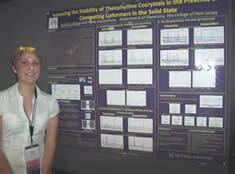 According to Urban, the most exciting part of her research was attending the annual meeting of the American Crystallographic Association last summer in Chicago. She and another TCNJ student presented their posters and attended talks given by incredible scientists, including several Nobel Prize winners. “Meeting and talking to scientists from all over, and learning about all the different types of jobs out there for chemists, was really great,” said Urban, who also received an award for her presentation. But it was certainly not the only award Urban has earned for her outstanding performance. Last spring, she was selected as one of only seven college students in the State of New Jersey to receive the esteemed Barry M. Goldwater Scholarship. The purpose of this national-level award is to provide a continuing source of highly qualified scientists, mathematicians, and engineers by awarding scholarships to college students who intend to pursue careers in these fields, awarding a maximum of $7,500 per year. Urban will continue her research with Dr. Abourahma throughout her senior year, in addition to working on a new project involving knot theory with mathematics professor Dr. Cynthia Curtis. Upon graduation, she plans to pursue a Ph.D. in Chemistry and conduct research in solid-state chemistry.